April 12. 100 Reasons to Go Outside. Hosted by the Helen Schuler Nature Centre. April 12, 7pm. Ecosystem Management Presentations, Part II. Bats, Raptors and Bird Banding. Hosted by the Lethbridge Naturalists at the Helen Schuler Nature Centre. April 22, 10 am-4 pm. Earth Day. Lethbridge Public Library Theatre Gallery. Featuring exhibits, activities and more. Opening address from Shannon Phillips. April 22. Earth Day at Value Village. Bring your donations to the Community Donation Centre. There will be displays, giveaways, raffles, and refreshments throughout the day. April 23-29. National Volunteer Week. Don’t forget to recognize your volunteers! April 25, 8pm. The Paul Reddick Band at the Geomatic Attic. April 26, 7pm. Monthly Meeting of the Southern Alberta Group for the Environment. Lethbridge Public Library. April 29. Alberta Bike Swap. Consign, donate or buy a gently used bike. Exhibition Park. May 2. 4pm. Lethbridge Green Drinks. Owl Acoustic Lounge 411-3 Ave S. Informal gathering to discuss environmental issues, projects and solutions. First Tuesday of each month. May 2, 6:30pm. Tea, herbs and medicine. Workshop hosted by SOUL-fully SOIL in Monarch, AB. May 3, 6:30pm. Permaculture Meets my Annual Garden: Creating a Sustainable Food System at Home. Workshop hosted by SOUL-fully SOIL in Monarch, AB. May 4 & 5. Live Well Showcase. 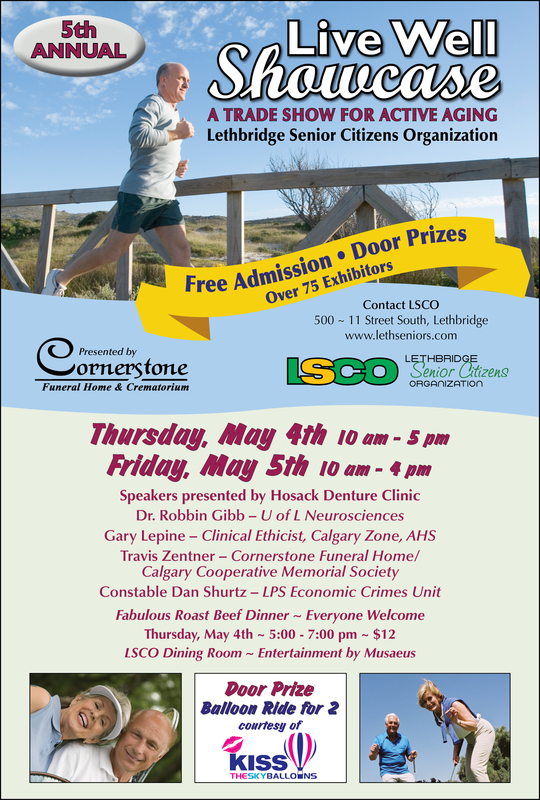 Hosted by the Lethbridge Senior Citizen’s Organization. May 5, 6 & 7. Jane’s Walk. Choose from a variety of local walks on topics such as local history, nature and more.